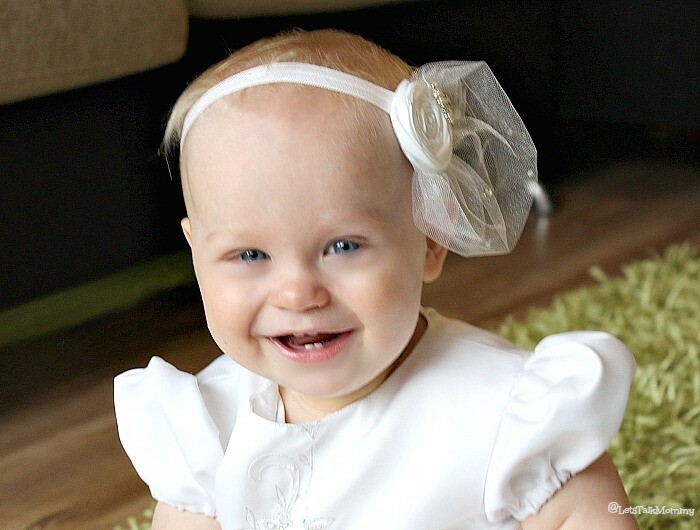 There was a lot of excitement in the Let’s Talk Mommy household last Sunday, with a double celebration of Missy Moo’s christening and first birthday party! I couldn’t believe how fast it came upon us. But we were ready for it, preparations had been being made for weeks. I should say rather that I was ready, after the many hours of home making decorations and organizing. I was also excited to show off Missy Moo to all our friends as many hadn’t met her yet. We started our perfect day with a little fashion show photo shoot for Missy Moo. A chance to capture her in her dress and headband before the masses of people were in her face, and the festivities were all around her to distract her. As always she didn’t stop smiling, not that morning, not all day, her continual happiness is entirely infectious. Her headband was amazing. It matched her dress perfectly and it was just what I was looking for. I had a friend in Canada make it for me and I couldn’t have been more happy with it. The satin on her dress was really hard to match otherwise. We all know how much I love a good headband. I was impressed that the netting didn’t bother her and she wore it for the whole morning until it was time to change outfits for her birthday party. It’s time for the dress. 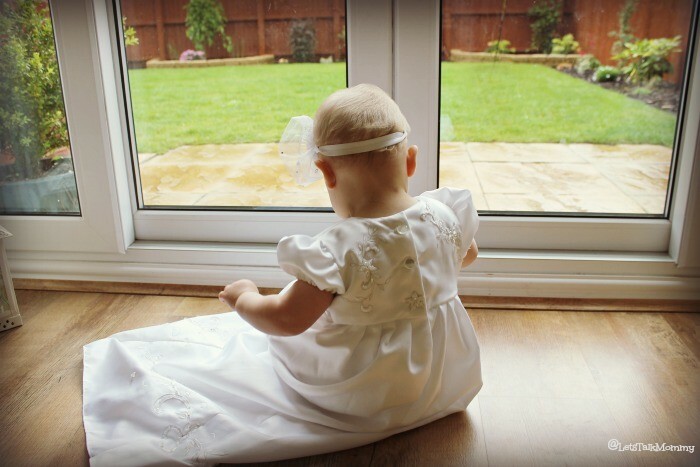 I was so impressed that my amazingly talented mother made such a gorgeous gown for my daughter out of my very own wedding dress. I have never been a believer in storing my wedding dress in the back of the closet to collect dust. I had Buba’s romper for his christening made out of it as well. It makes their outfits, that much more special and sentimental. Her dress was truly stunning. I admit, I cried twice, once when I put it on her and once at the church. 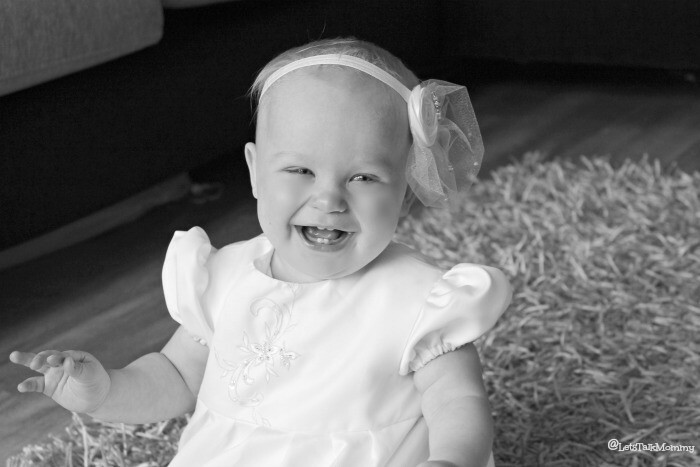 To see my little girl in my own dress, looking so beautiful really brought tears to my eyes. I only wish that my mother could have been there to see her in her master piece. It was an emotional but magical moment. A big group of people met us at the house and we all made our way to the church for the baptism. It’s the same church Buba was christened at too. I like to have traditions in the family. It was great to be able to tell Buba, now that he is older, that he got christened there too. He was very excited about that when I told him. Excuse the photos below as the church was a bit dark with all the bright sun glaring in from the windows so they turned out a bit grainy. 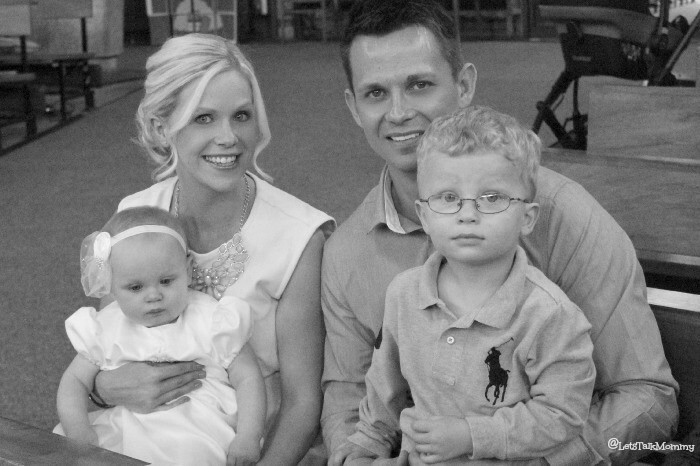 My sweet family, I am forever grateful for you all! 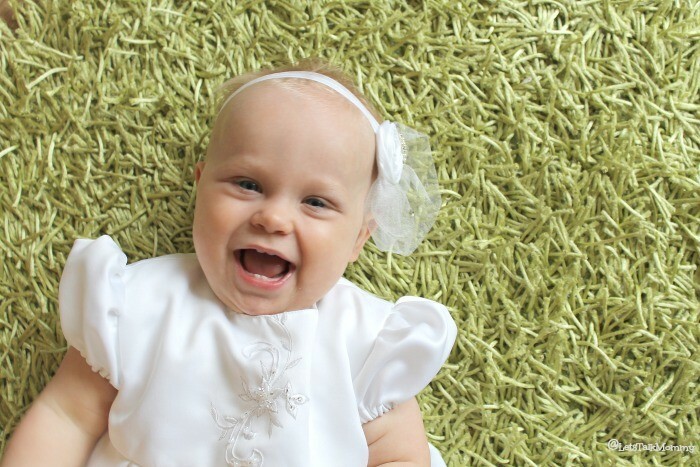 In true Missy Moo fashion, she was smiling at everyone and clapping her hands at the priest. 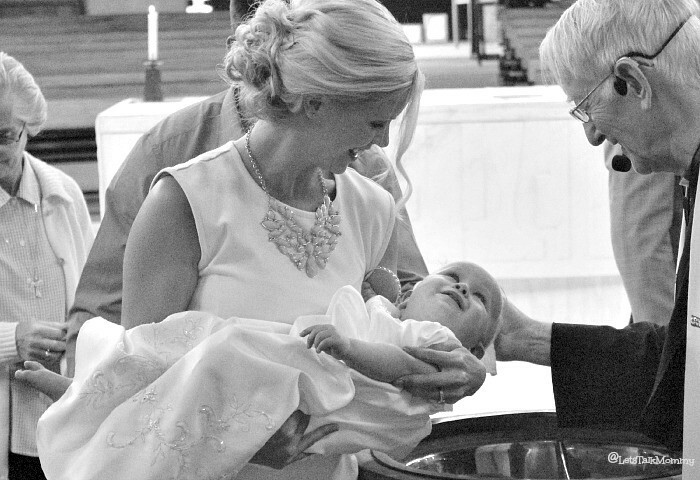 When she got baptised, she looked at the priest and gave out the biggest giggle ever. It was so sweet. It was an honor to have my best friend, S, as her godmother, and Mr P’s childhood best friend as godfather. We are lucky to have such great role models and friends in our kids lives to help guide them and support them if they ever need it. I know in England, many have more than one of each, but in the states it’s much different. You choose one of each. You pick the two people you would trust in raising your children if anything ever happened to you, a person that they know they can go to, to get unbiased opinions from, and just be another family member to love and make memories with. It was a special day to have our friends and family with us to witness. I couldn’t ask for two better children, a more loving husband and more supportive friends. 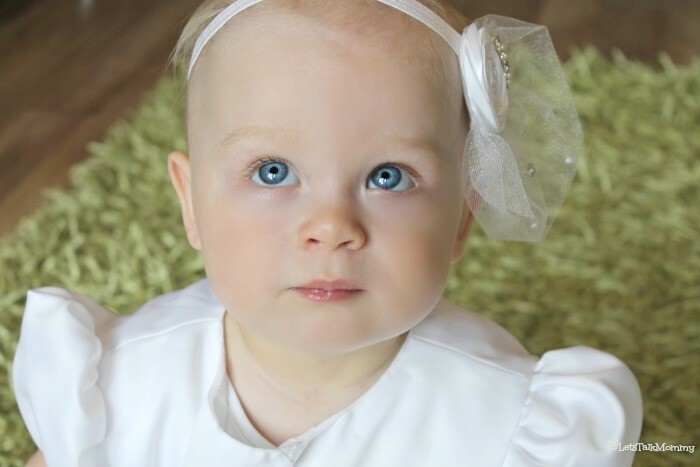 I am the luckiest person in the whole world, or at least that’s how I felt on this very magical day at Missy Moo’s christening! Coming soon is the after party for her 1st birthday bash! Thank you Emma. It truly was a magical day! Yes, I am all about the traditions and extra sentimental value to my dress! Thank you hunny. Yes it meant a lot that they could wear my wedding dress for their special occassions. Thanks Rebecca. It was the perfect day. Went so smoothly, I couldn’t have asked for more. Ahhh! What a special day! Thank you I was excited how good of a mood she was in and the pre-baptising photos came out great. How lovely and especially as your mum made the beautiful gown and your family were there to enjoy the moment too. Thanks Iona, yes it made it that much more special. 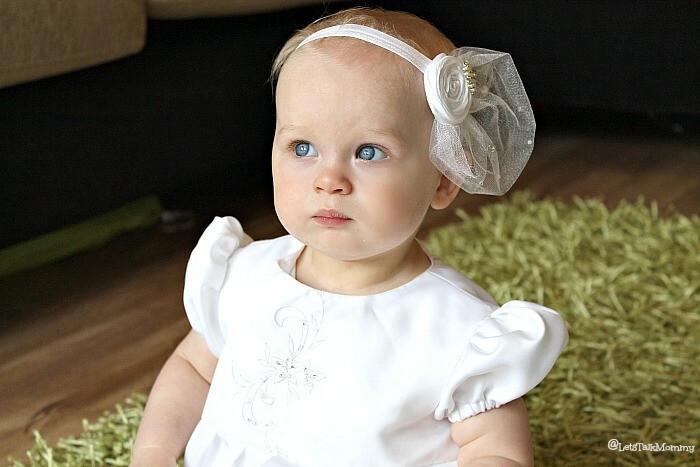 Oh my what stunning photos of you all, I just love the little head peice and the family photos too. These are ones to treasure. Thank you so much Fiona. I was really pleased how great the headband came out and matched the dress so perfectly. Definitely ones to cherish forever! Thanks hunny. Can’t wait to share the birthday party as soon as I edit the photos. And the cake smashing too! So many great things to come! Thank you so much Maddy so sweet of you to say. I am very grateful for them. 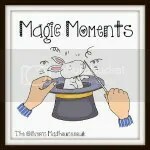 What a truly magic moment. 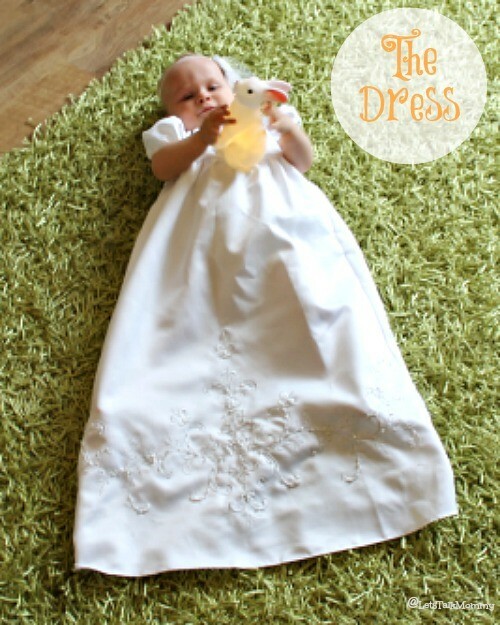 I love how the christening gown was your wedding dress and she looks gorgeous in it. Thanks for stopping by and for your lovely comments. It truly was a magical day! 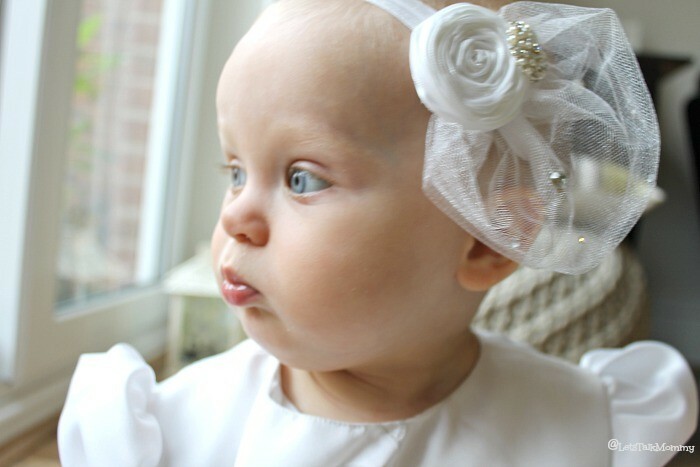 I made both my kids christening outfits out of my dress. Lots of great memories made! Thanks Izzie! I really was so pleased how well it all went. Thanks Charly you are ever so sweet. I love a good international ensemble! lol Thank you so much for hosting. Glad you like the photos. I am really trying harder to get better. Oh yes had to do a little informal before we left was worried I wouldnt get time to capture the dress. So right I was! She is always smiling but yes she was on perfect form as was her brother that day. We are so very lucky! It was a magical day! Thanks hunny, yes indeed I really hope so. It was a lovely day and we made a lot of lifetime memories. 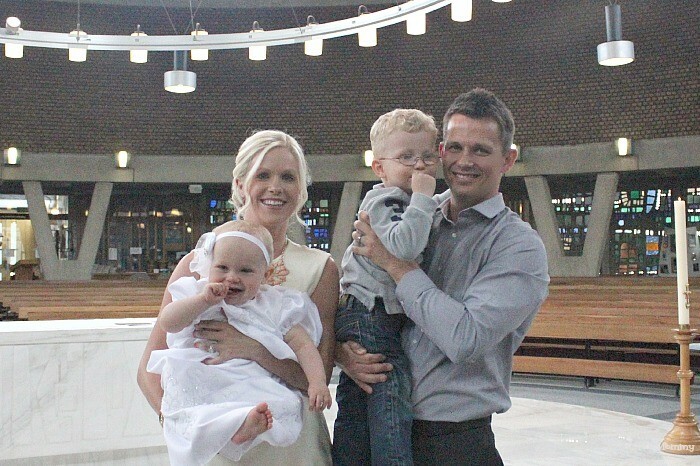 Oh that is so sweet to have a tradition of the same baptism dress throughout the family. I love things like that. Means more. Yes I am the same, it definitely is a celebration of life! Thank you Caroline. If you were there you would have been laughing like everyone else too. Every time the priest raised his hands so did she, then clapped and giggled. It was priceless. Thank you so much Hayley. Yes it truly was a day to remember, a magical day indeed! Lovely comments hun. What gorgeous photos and such beautiful eyes! Thank you so much Bex!!! Like her momma right? hahaha only joking! Michelle it truly was. Thank you. One to cherish forever! Lovely photos-congrats to you all. I know I don’t know where it came from. It just popped out one day and it’s getting longer every week! I love it. Can’t wait to do various things with it. She definitely is the happiest baby ever! I know I’ve said it before but that gown is just gorgeous, and she looks beautiful in it – what a wonderful way to add an extra dimension to an already special day! Thank you so much cathie!! Yes made it even more special. Jenny, you all look gorgeous and looks like you are having a fantastic day. Your mum is so talented to be able to make Missy Moo’s dress out of your wedding dress. Thank you so much Emma. It really was a magical day. I was so impressed with the kids they were on their best behaviour. Aww! You look so happy, obviously where she gets it from! Hope you all had an amazing day. Ahh Thanks Sarah that is so sweet of you to say! We really did have an amazing day! Ahh Vicky u r too sweet thank you. Wow urs sounds lovely too!!! Thanks Sara. It turned out just perfect. Kids were angels all day with no nap I was impressed.